basket chaat recipe | potato basket recipe | aloo basket chaat with detailed photo and video recipe. 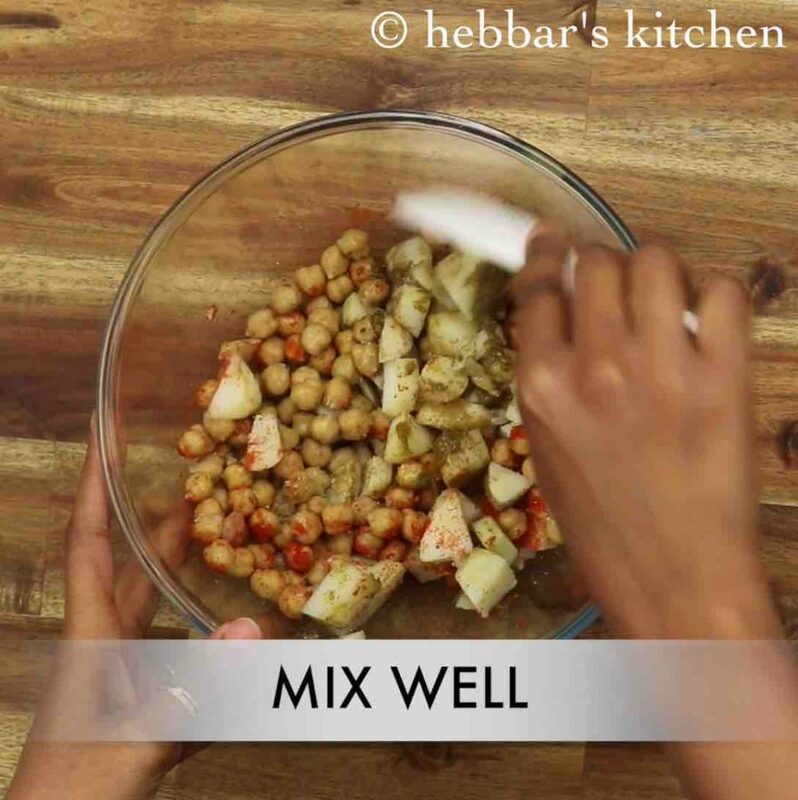 a unique and popular chaat recipe from northern india, especially from lucknow. 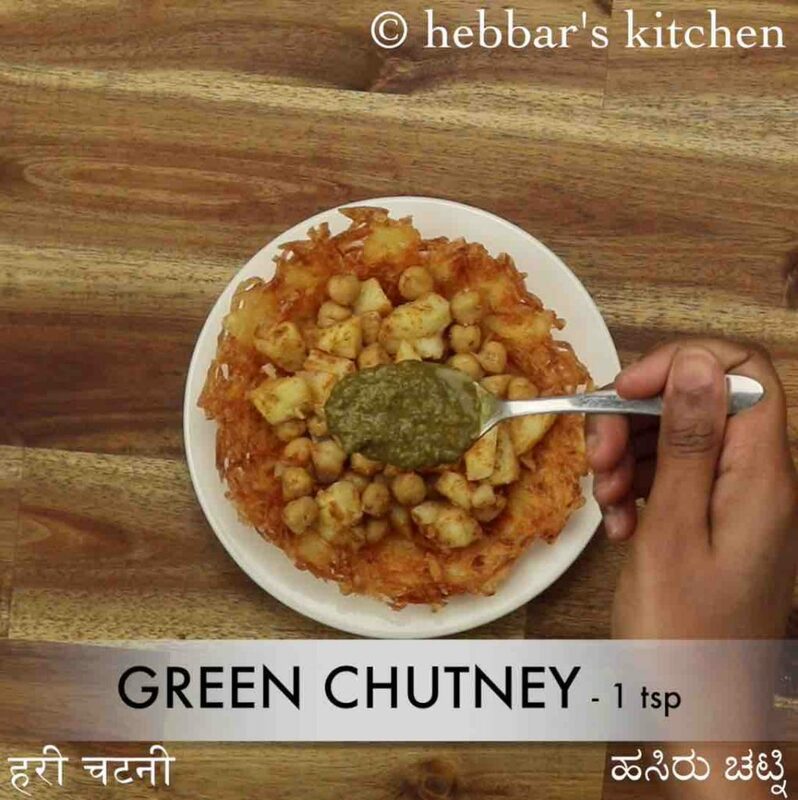 it is made with grated and deep fried potatoes which is later topped with the chaat chutneys and savouries. 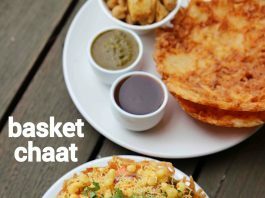 the whole idea of this chaat recipe is to serve in an edible basket and the basket becomes a part of the chaat recipe. basket chaat recipe | potato basket recipe | aloo basket chaat with step by step photo and video recipe. each region or state has a myriad and lip-smacking street food recipes. it can be either indo chinese or perhaps chatpata chaat recipes filled with flavours and taste. 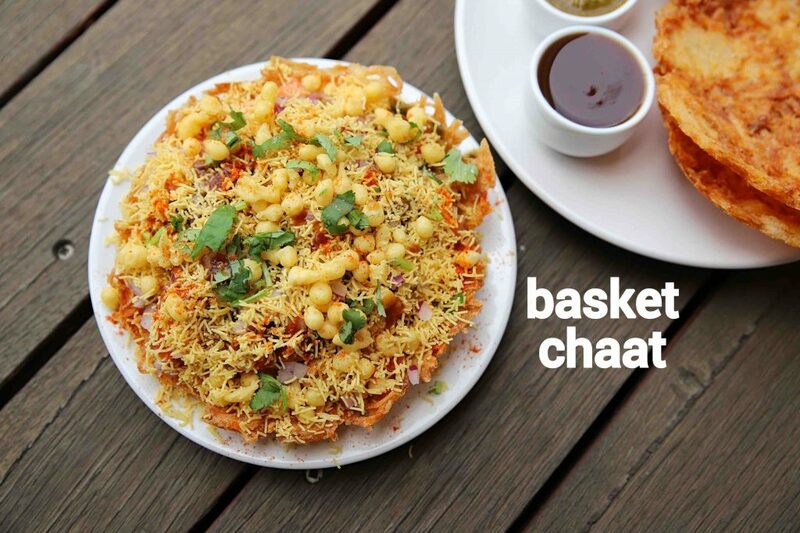 one such unique and a fusion recipe is aloo basket chaat recipe made and served in deep fried basket with chaat ingredients toppings. 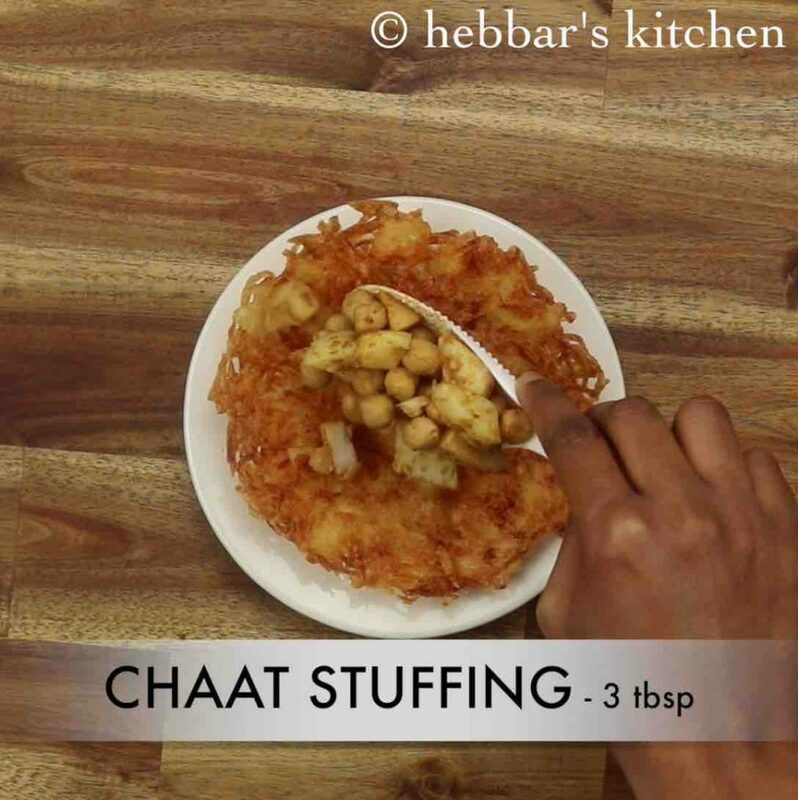 there are hundreds of thousands of chaat recipes across india and each recipe is popular and tasty in its native location. this recipe of aloo basket chaat recipe hails from north india, especially from the state of uttar pradesh. as matter of fact, the aloo basket is used as bowl for many chaat and snack recipes. 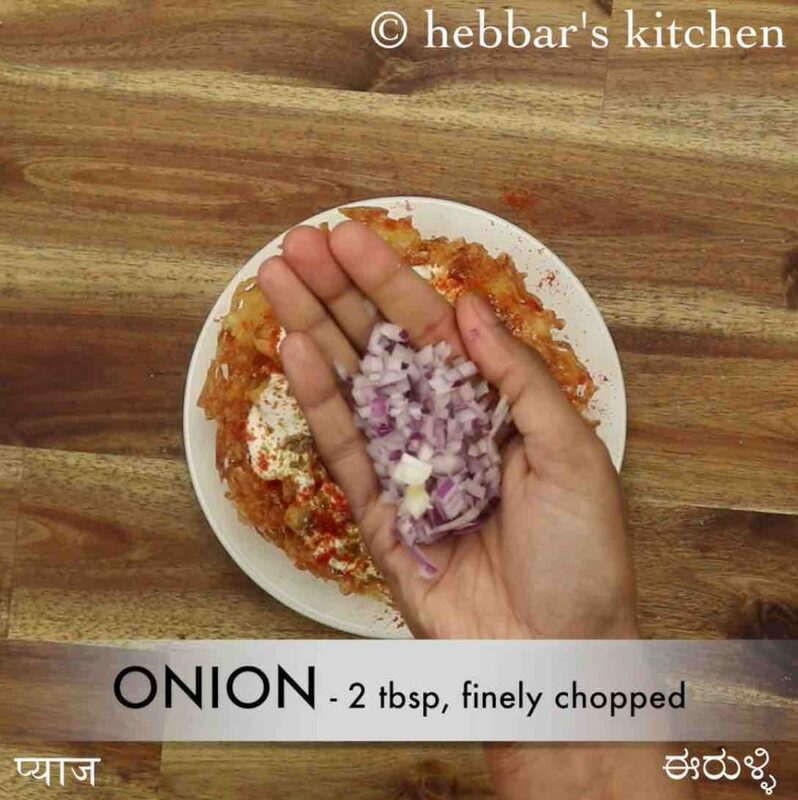 in this i have topped it with chaat ingredients like chaat chutneys, fine sev and finely chopped onions and tomatoes. but there are other versions of it where it can topped with aloo tikki or even with dahi bhalla recipe. i have also received a request for aloo basket pizza recipe which should be quite popular in many indian urban cities. i have some leftover aloo basket and i am planning to come up with aloo basket pizza recipe. furthermore, some variations and suggestions while preparing the aloo basket chaat recipe. 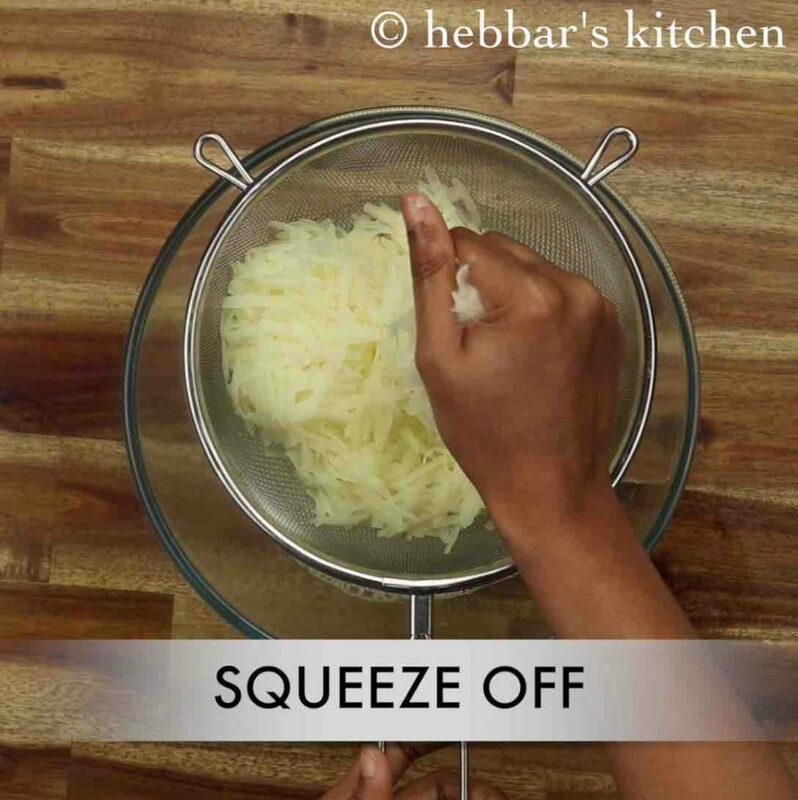 firstly, after the potatoes are peeled and grated, ensure to squeeze them to remove excess moisture. more moisture may not lead to crisp basket also may spoil the hot oil. secondly, i have used corn flour to mix it with grated potatoes which should help to shape the basket. 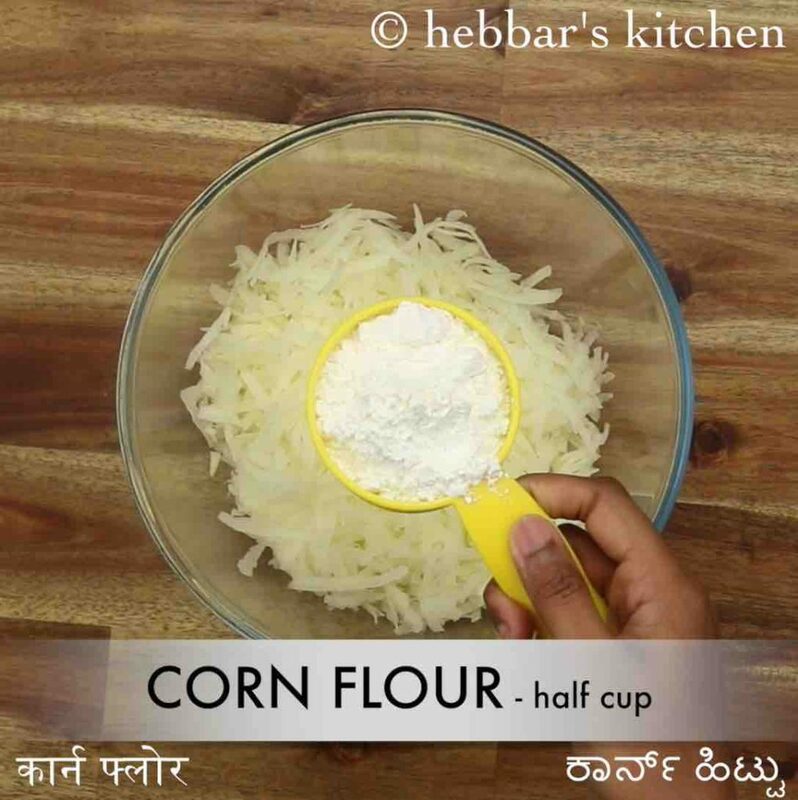 you can also use corn starch or combination of corn flour and plain flour. 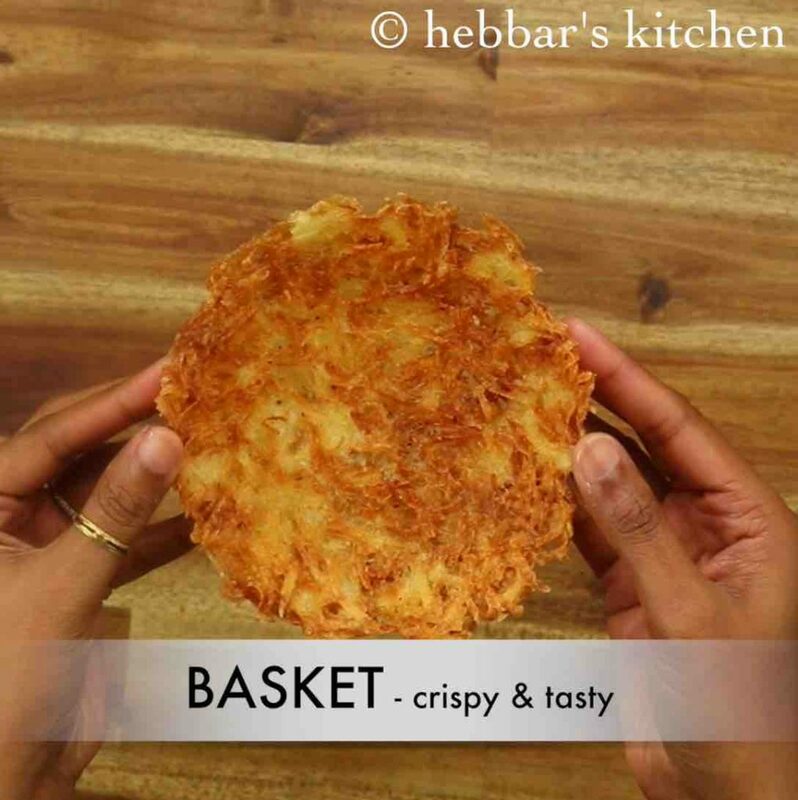 lastly, you can make these potato basket well ahead in advance and top with your desired chaat ingredients when required. firstly, peel and grate 3 potato. 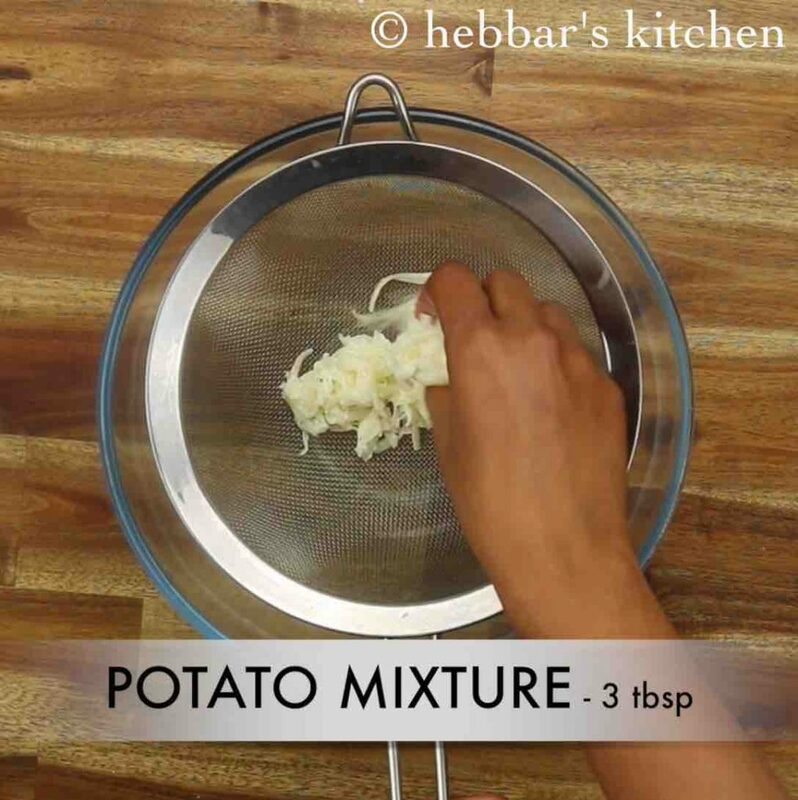 use fresh potatoes, else aloo basket will not be crispy. further add ½ cup corn flour and ½ tsp salt. 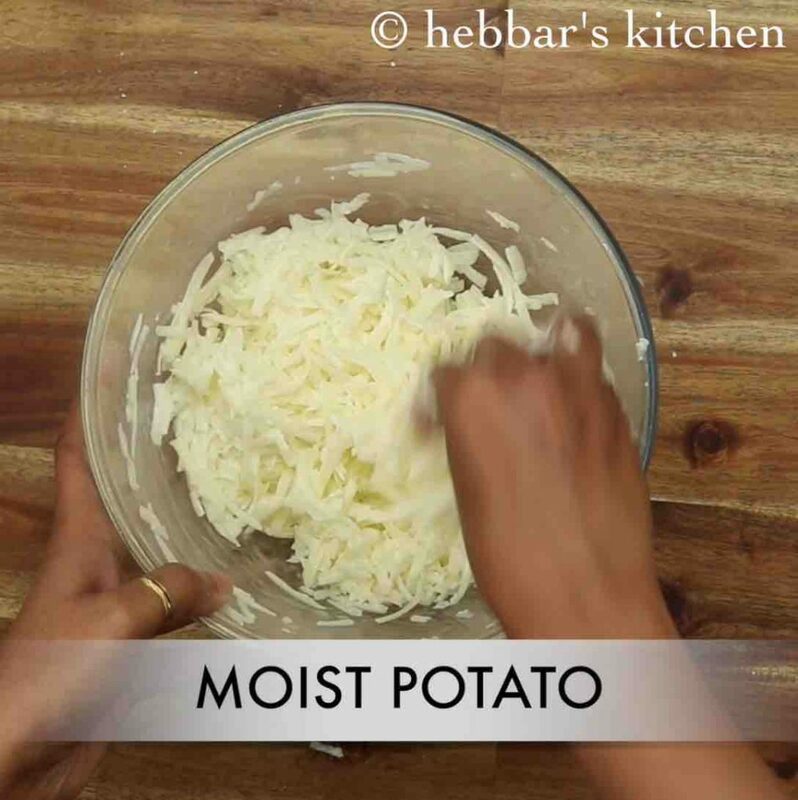 squeeze the potato and prepare a moist potato mixture. now spread the potato mixture over sieve. deep fry in hot oil until it turns golden brown. 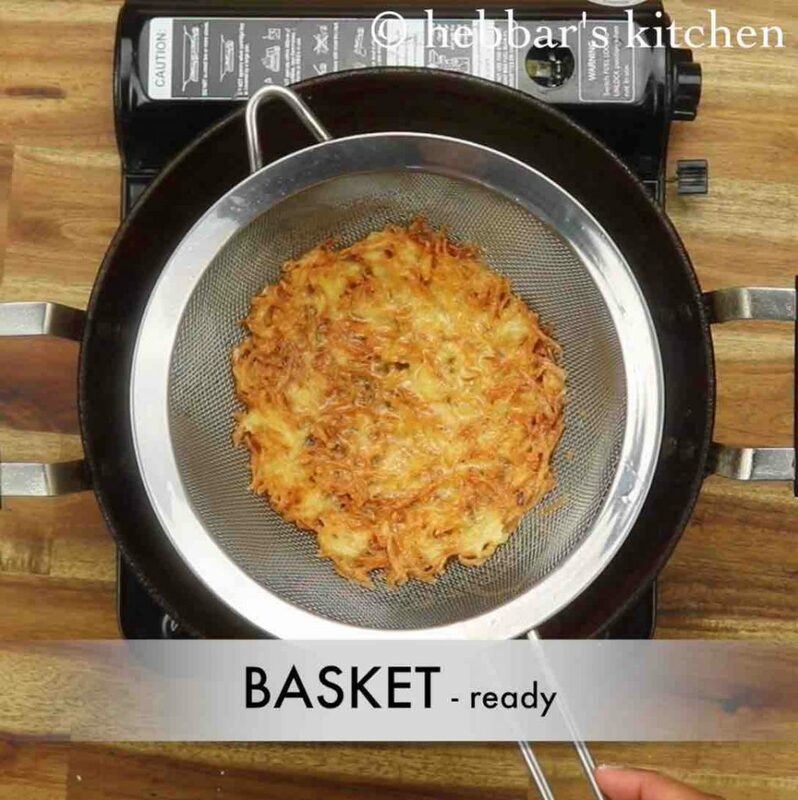 finally, prepare the potato basket chaat using prepared aloo basket. now spread the potato mixture over sieve. you can use sieve of your choice, like tea strainer. 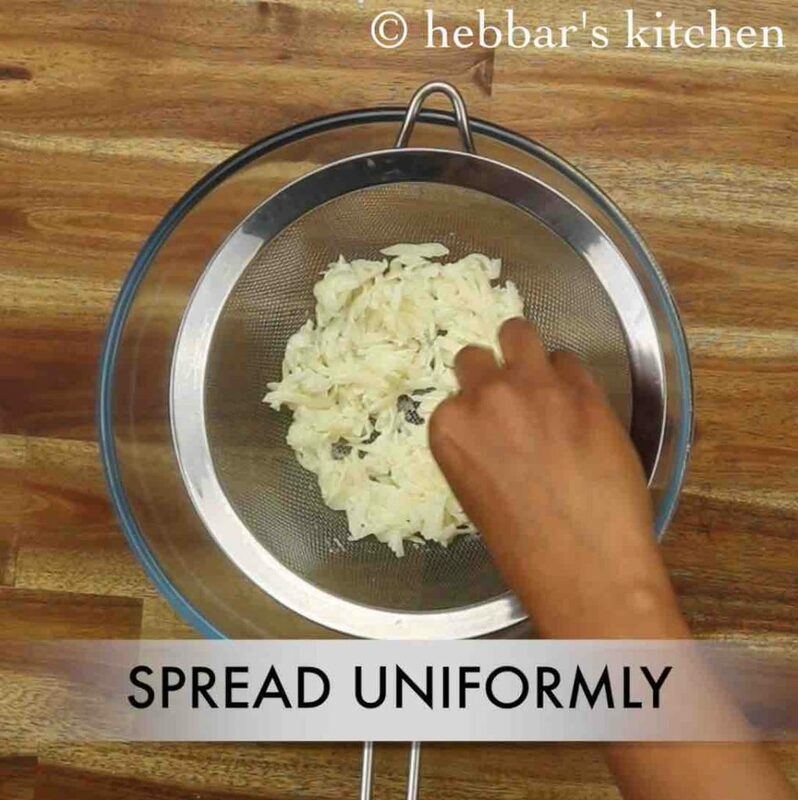 spread the potato mixture as thin as possible covering uniformly. 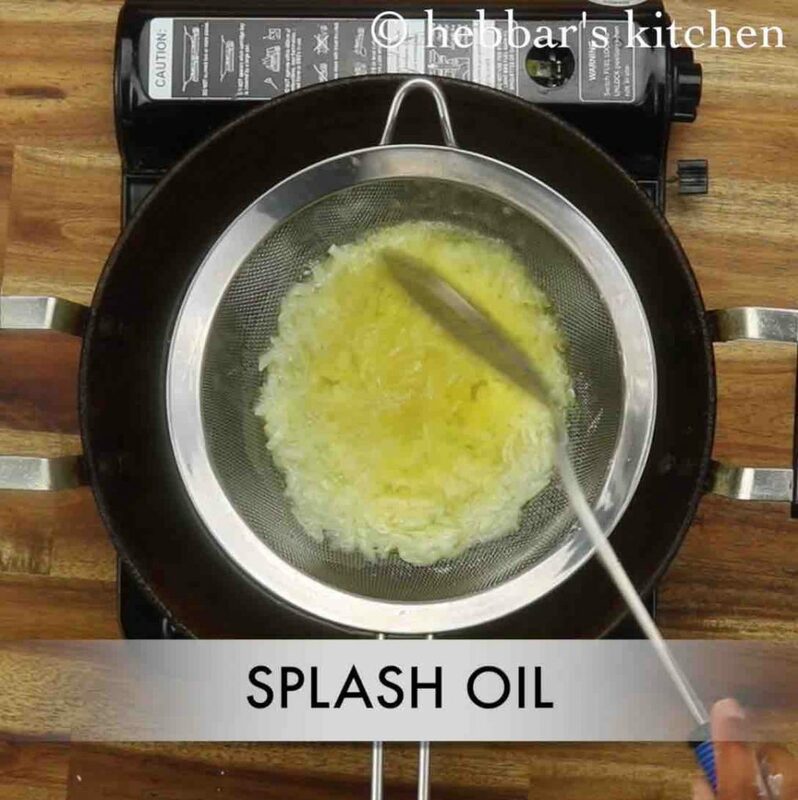 splash oil over sides for uniform frying. swirl and fry on all sides until it turns golden brown. 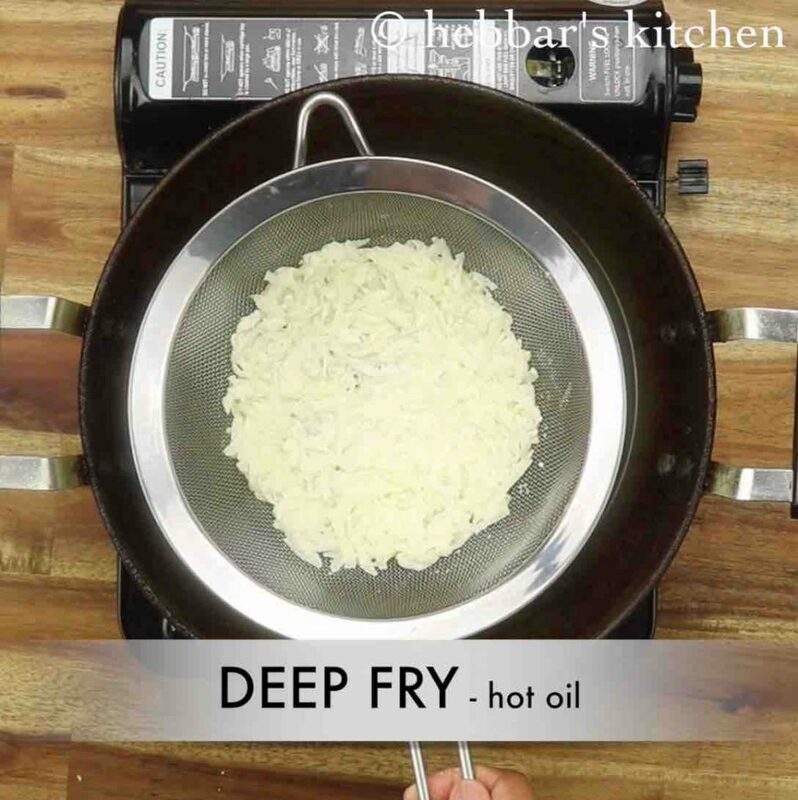 allow to rest for 5 minutes, allowing to drain off oil completely and cool. 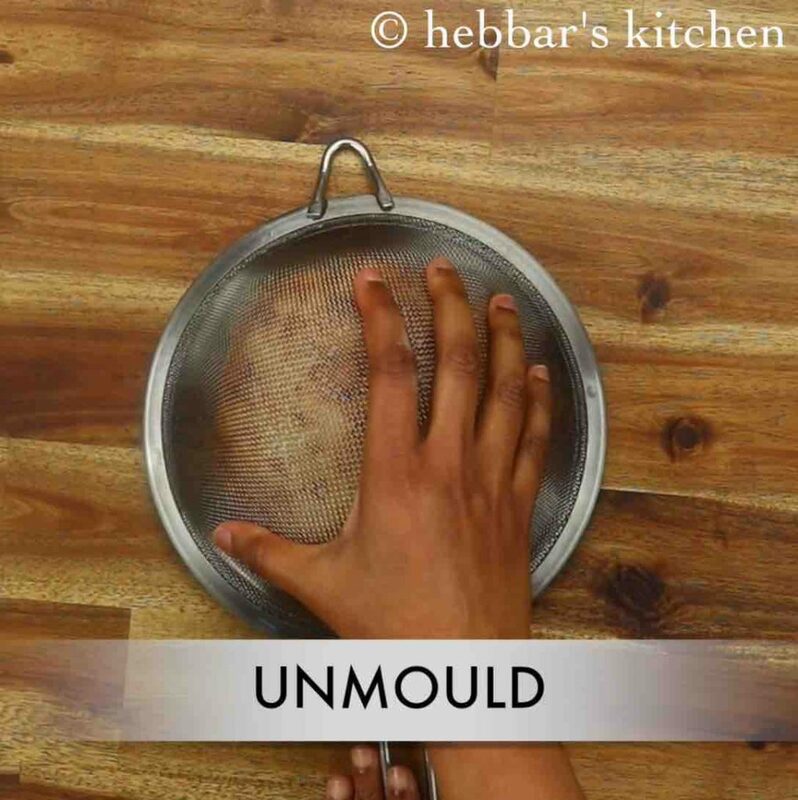 now unmould the aloo basket, without damaging it. 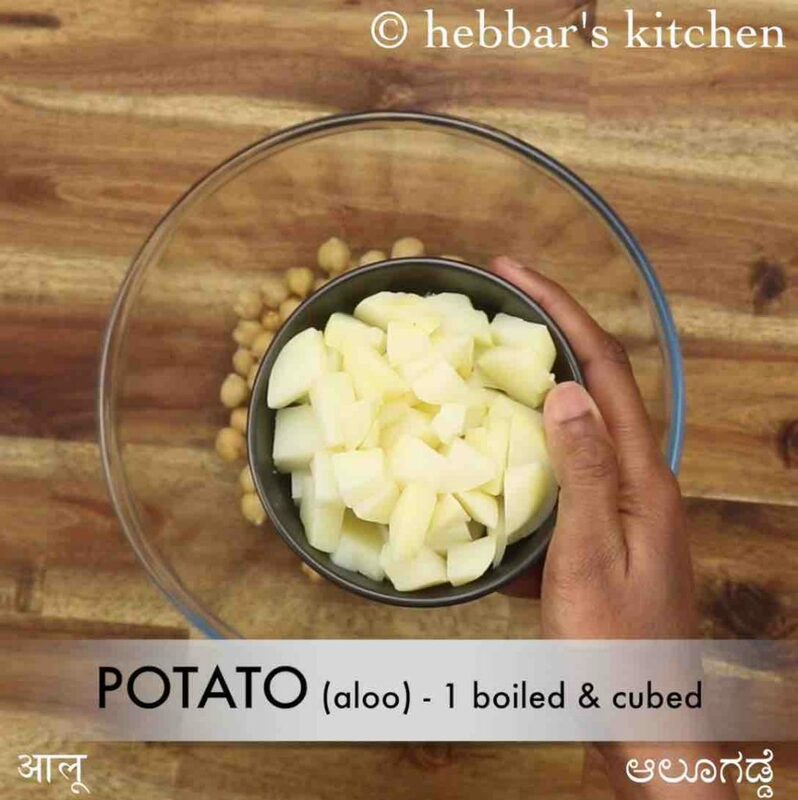 finally, aloo basket is ready, store in an airtight container for a week or more and prepare chaat when required. firstly, prepare the stuffing by taking 1 cup boiled chana and 1 boiled potato. 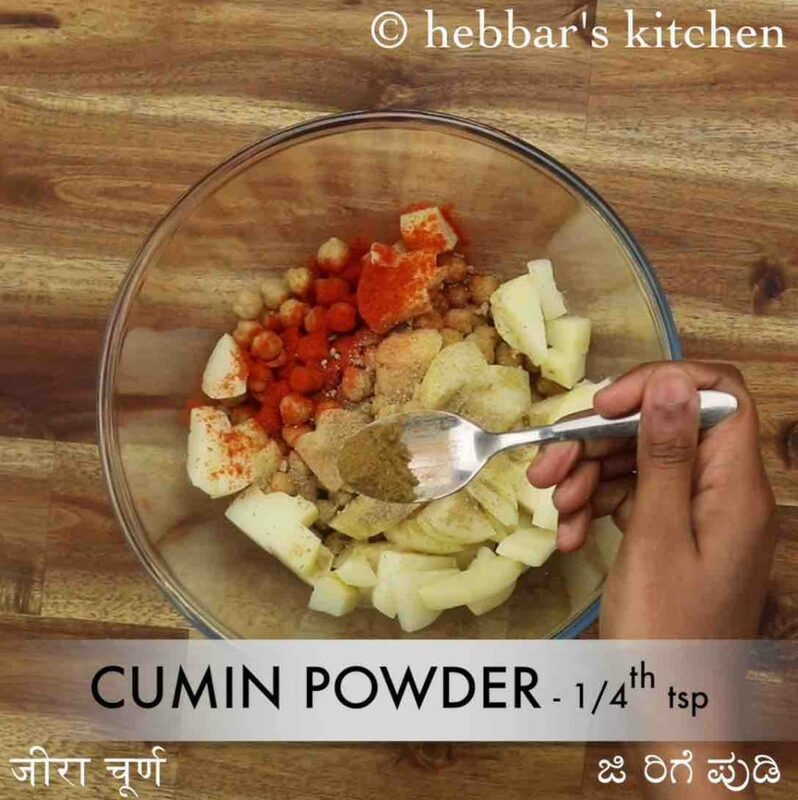 also add ½ tsp chilli powder, ½ tsp aamchur, ½ tsp chaat masala, ¼ tsp cumin powder, 1 tsp green chutney and ½ tsp salt. further spread 3 tbsp of prepared aloo chana mixture over basket. pour 1 tsp green chutney and 1 tsp tamarind chutney. 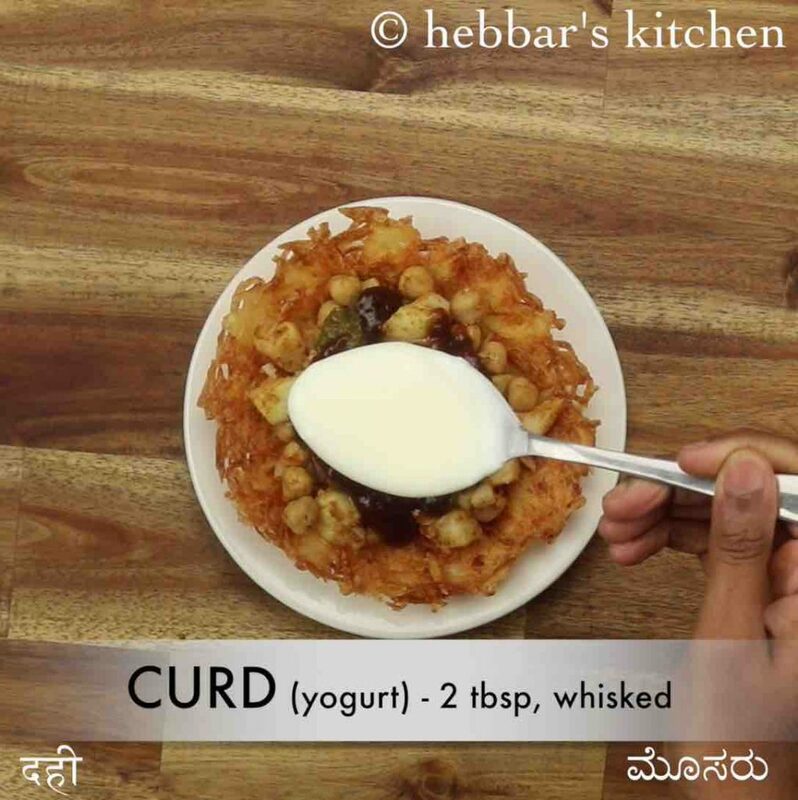 also top with 2 tbsp curd. 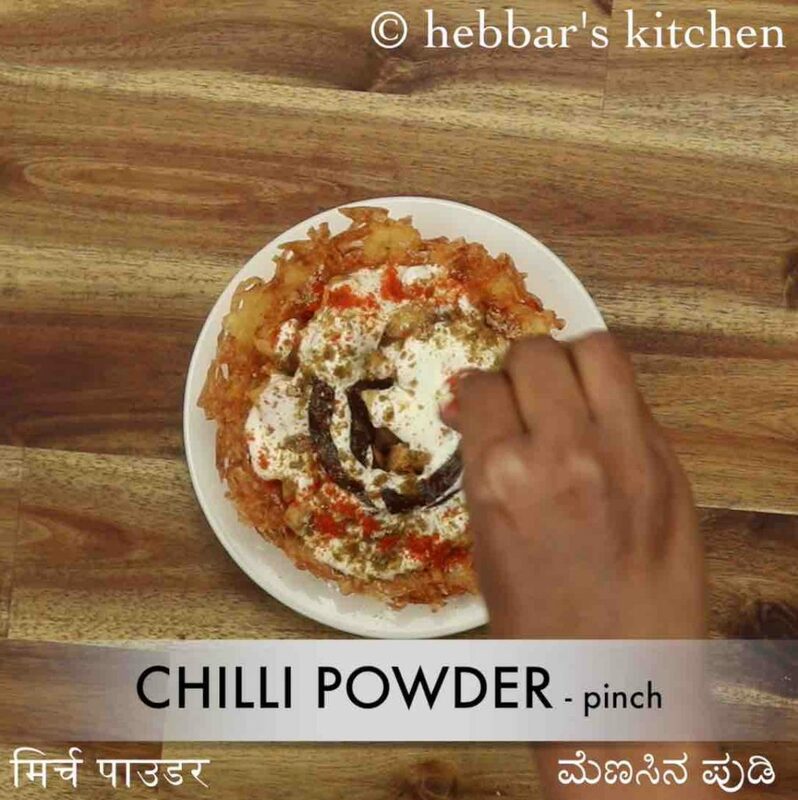 additionally, sprinkle pinch of chaat masala, cumin powder, aamchur, chilli powder and salt. also spread 2 tbsp onion and 2 tbsp tomato. add more green chutney and tamarind chutney if required. 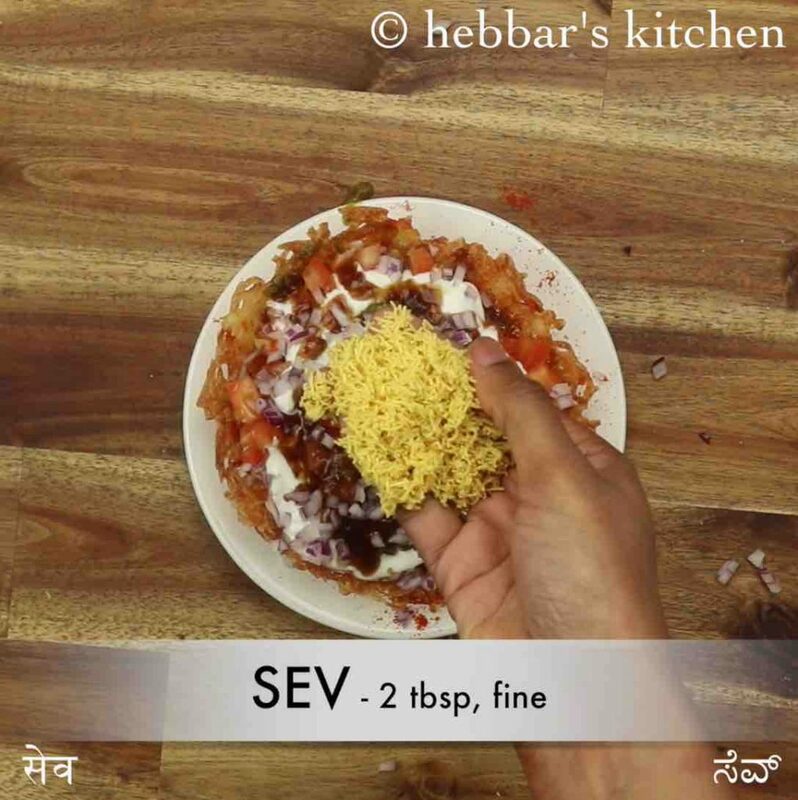 now sprinkle 2 tbsp sev, 2 tbsp boondi and 2 tsp coriander. 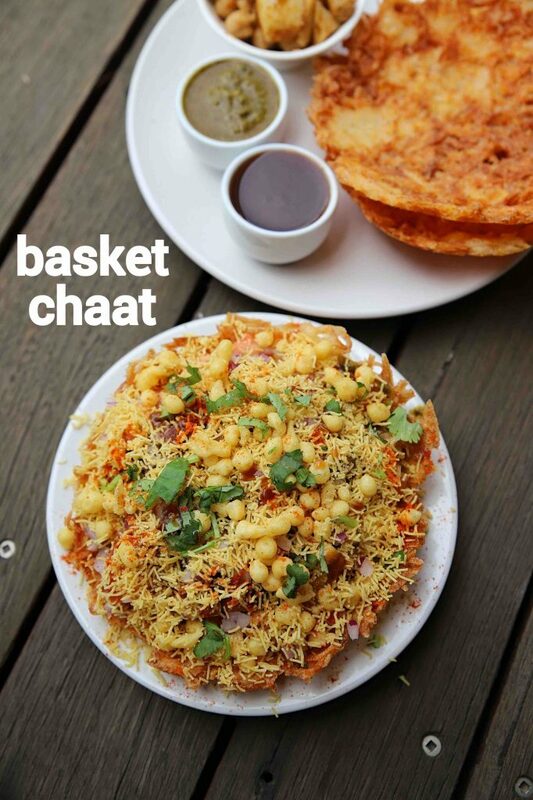 finally, enjoy potato basket chaat as a evening snack. 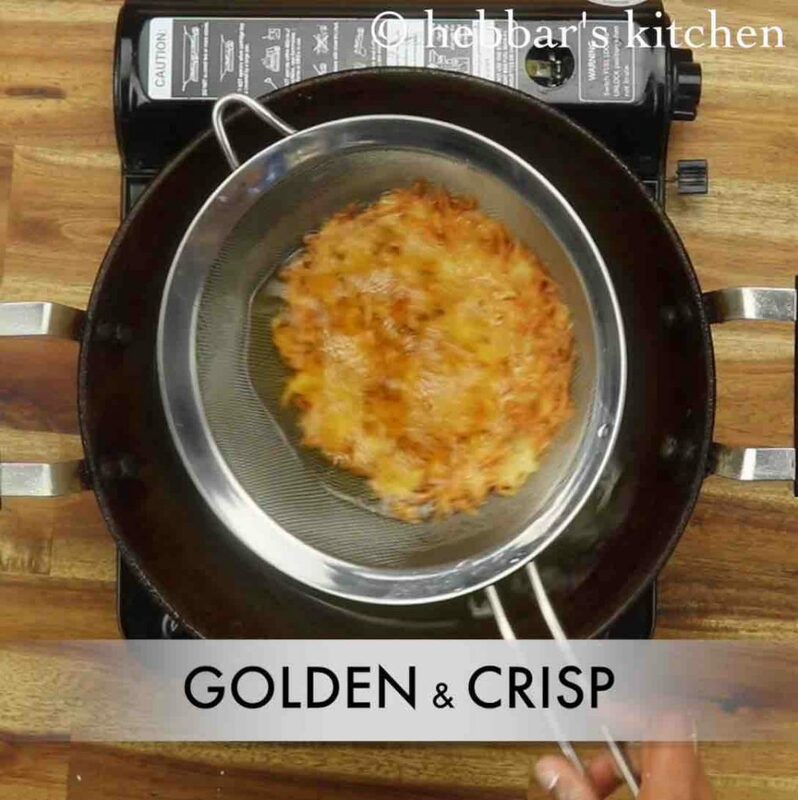 firstly, fry the aloo basket on medium flame until the aloo turns golden and crisp. additionally, stuff the chaat with aloo tikki and dahi bhalla for more rich street style. 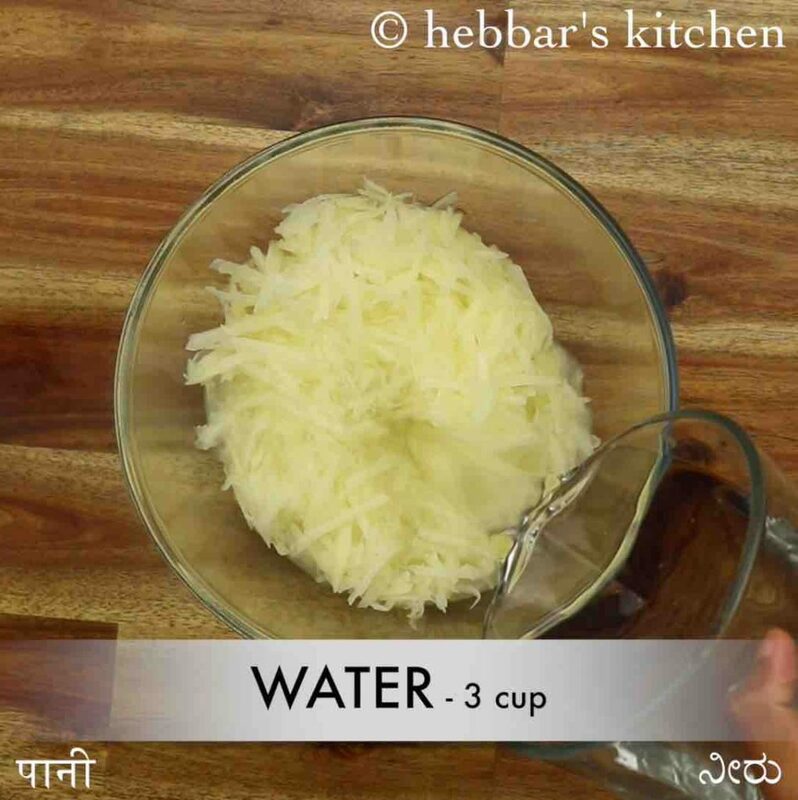 also, use fresh curd, else the chaat will taste too sour. 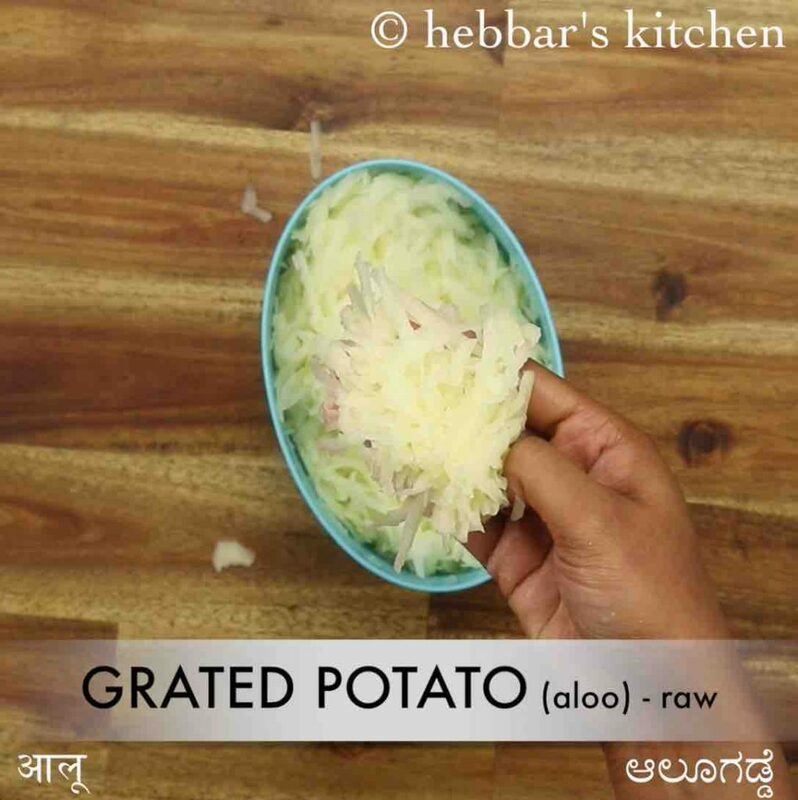 finally, aloo basket chaat recipe tastes great when served with more curd.